with my being on the East Coast and Howard and Diedra on the West. - A "Mission Statement" of sorts. - My being "interviewed" and answering the guest "questionnaire". 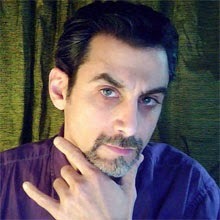 - Howard's turn to do so. - Our predictions for the post-credits trailers for director Scott Derrickson's "Doctor Strange" film. These are just the first few offerings, introductory teasers, if you will. We've recorded others and shall record more still, and will upload them in time. Diedra ("Deee") is a noted Cosplayer and Dr. Strange fan. Her insights are valuable as not only a knowledgable and insightful Doctor Strange fan, but also can present us with a female perspective as well as a newer fan's viewpoint (although, she is wise in the ways of Strange far beyond her years). 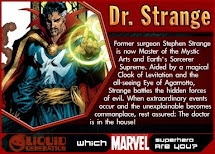 Howard Hallis - owner of one of the World's Largest Doctor Strange collections, and Dr. Strange uber-fan, is the artist of the renowned "Picture of Everything" and is also a former associate of the late Dr. Timothy Leary. PTOR - A renowned expert on Doctor Strange, having been a Dr. Strange uber-fan for nearly 40Years, I am also an owner of one of, and most likely THE World's Largest Doctor Strange Collections, as well as a writer/artist (having worked briefly in comics, as well as other media). and together we have a PHD in Doctor Strange. Will these be made portable in the future? We're JUST starting out, and as such, we're going to have some birthing/growing pains. As it is, we're recording from two ends of the USA and there are other technical issues to be dealt with. In time, I'd like these to be downloadable, hosted on several sites (like youtube - we're going to branch into video podcasts as well) and such. I hope to reach out to veteran podcasters out there who may help offer us advise and technical assists. For now, Howard designed and built the page, and it's pretty nifty thus far. 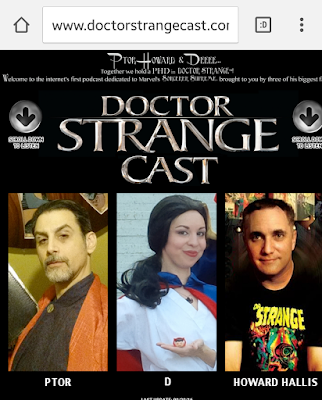 We hope to have more content up soon on the "StrangeCast" (Doctor StrangeCast, really, but we got into the bad habit of calling it "Strangecast" as it just rolled off the tongue). And look for more blog posts HERE as well. Thanks for listening and responding! Podcasts are like TV, they get better as they go and the creators figure out what works best for them. The main reason I asked about the future is because when I saw the episodes posted I so much wanted to listen to them but had to head out to work! I've tweeted at you here and there (@dex1138) and I'm pretty much in the same boat as you, I found Strange at a young age and he became my favorite comic character. I haven't done much collecting aside from comics but that will probably change with a freaking movie coming out. Never could I have imagined we'd ever get a movie. 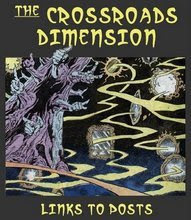 I was hoping for more Ditko-trippy than the Inception style stuff we've seen so far, but who knows? Even if the movie were terrible (highly doubt it) it's still a blessing for us Strange fans because there will finally be an abundance of merch to choose from. Looking forward to more shows! and we are looking forward to ironing out the kinks. Odd that you mention the "glowing head", as Howard has always liked the idea (even as far back as when we first started thinking of video podcast) that I'd be a voice coming from some avatar, photo or astral plane. We both have a 6ft Doctor Strange standee, and he was going to have my voice seem like it emanated from there. As it is, we're currently looking into software that allows for clear multi-location recording, in synched time, because we do plan on having guest callers (we have a few lined up already, actually), and we'd like to have as clear voice-quality as possible. I mean, I don't MIND being an astral voice, if it weren't so hard to hear. As for merch... I'm on the other side of that argument, because, as a completeist, there's just TOO much stuff coming out now for the film. Even Howard and Dee agree (as do most twitterers with whom I tweet), MOST of it thus far, is sub-par crap, cranked out for the quick cash-grab. So, it's painful to "have to" get this stuff, and most of it is lame. But, don't listen to this old man complaining about "too much", if you're a fan and aren't insane, like me or Howard, and only get what you LIKE, then you;ll certainly have ample merch from which to choose. Oh, and THANKS for following me on the twitter. 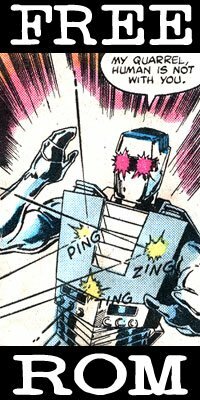 I haven't been looking to see what's coming, aside from the Marvel Legends, I kind of want the thrill of finding random stuff. Yeah, I, uh...already ordered it. Like a day or two after it was officially announced. You have NO idea hour much I want to. B) well...actually that's pretty much it. I'd be THRILLED to do it. Yaaaay! So glad to see you back in the blogosphere, Ptor! I'm looking forward to listening to your podcasts!